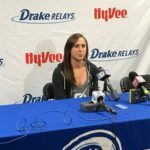 Sioux City native Shelby Houlihan returns next week to compete in the 1,500 and 5,000 meter runs at the USA Track and Field Championships at Drake Stadium. The 2016 Olympian won multiple Drake Relays titles and eight state championships at Drake Stadium as a prep standout at Sioux City East. Houlihan has been training in the high altitude of Mammoth Lakes, California, since April and her times have been dropping. She won the 1,500 at the Prefontaine Classic in May and shaved four seconds off her personal record in the process. Houlihan is the top ranked American and currently ranked number four in the world at that distance. Houlihan finished 11th in the 500 meters at the Rio Olympics in 2016. She returned to Sioux City last October where a street was named in her honor. Houlihan Run is near East High School.